Long Range PTZ camera systems are available with optical or thermal imaging cameras, or both in one system. These customized IP camera systems provide night-vision using either a long-range laser illuminator or an additional thermal camera. We build the long-range surveillance system exactly to your requirements. These IP camera systems include a very long-distance lens and special pan-tilt mechanisms that allow you to see details that are over 2 miles away. It attaches to your network and can be integrated into a complete security system. There are some off-the-shelf camera systems available as well. Do you want to detect something in the distance? Do you want to recognize if it’s a truck or car? Or, do you want to be able to identify a person’s face or a license plate? Take a look at our definitions below and read our article, How far can we see with PTZ IR camera. Do you plan to mount the camera on a ship or vehicle that requires a camera system with motion stabilization? Read about camera stabilization in our article, IP Camera Motion Stabilization. The chart below provides examples of custom-made long-range cameras that can be used day or night. The ranges are provided for human targets. We can see vehicles or ships further away, and of course, the size of the object will determine the distance. Note that anything that’s over about 3 miles away is beyond the curvature of the earth and at extreme distances atmospheric conditions will determine actual visibility. For more information about real-world range calculations, take a look at our article, “Detection, Recognition, Identification: The New Criteria“. Extreme range multi-sensor camera system. Includes high-resolution optical camera system with 2000 mm zoom lens, and a thermal camera (640 x 480) with 35 – 155 mm thermal lens. Night (using the laser): 1.24 Miles (2000 m) Optical Zoom: 125X, 16 mm to 2000 mm remote zoom lens. Warning Note: Lasers with over 15-Watt power levels can exceed the danger limit for human eyes at close range. This is called the Nominal Ocular Hazard Distance (NOHD). The risk of eye damage can be reduced by preventing people from being too close to the illuminator. An active range finder system can be added to the camera system that automatically turns off the illuminator whenever an object is closer than this minimum range. Custom Designed Long range IP Camera Systems: Our long-range PTZ IP systems are designed to your requirements. This means we can design and build a long-range camera system that exactly meets your objectives and budget. 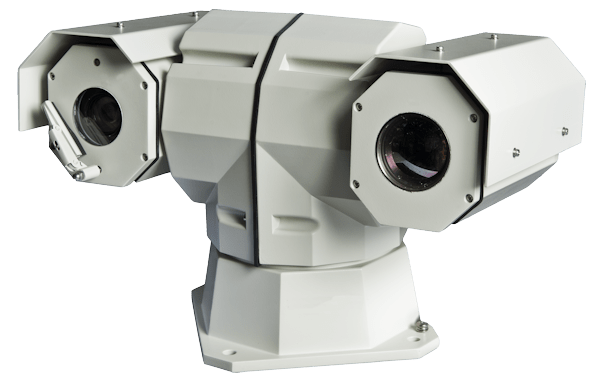 These high-performance PTZ systems include not only a very long range optical camera system but also a thermal imaging camera for operation in total darkness. The optional synchronized laser illuminator can be selected for ranges from 500 M to 5000 M allowing you to see at night over 3 miles away. Need more details or pricing? Give us a call at 1-800-431-165 or 914-944-3425 or contact. We can design the long-range IP camera system that exactly meets your requirements. Technical Notes To help you understand the technology. Thermal versus Optical IP Cameras explains the difference between these surveillance camera systems and describes the when each technology should be used. Seeing in the Dark describes the technology available to see better than an owl. How Far Can We See With the PTZ IP Camera provides the details about how we calculate the ranges for the cameras based on the criteria of detection, recognition, and identification. Comparison of Long Range Cameras reviews the components that make up a long-range camera system and shows how total system performance determines the price. IP camera Motion Stabilization compares the different image stabilization techniques available and how they work. Contact us for help selecting the right cameras, lenses, enclosures, NVR software and more. Both types of cameras allow you to see in the dark, but the Thermal Imaging cameras utilize the heat energy radiating from the object viewed, while the Infrared or IR cameras utilize an IR illuminator. The Thermal Imaging system can detect an object further away, and operate through fog and dust, but the Optical IR camera system provides much better resolution and grayscale making it possible to identify a person’s face or license plate number. The Optical IR PTZ system utilizes a unique fully zoom-able Continuous Wave Laser Illumination system. This patent-pending capability makes it much easier to focus on a remote target. To learn more about when to use a thermal camera or an optical camera, take a look at our article, Thermal versus Optical IP Cameras. The Johnson Criteria uses line pairs for all these definitions. The criteria also say that the probability of detection by the observer is about is 50%. A line pair is equal to 4 to 5 pixels. Thermal imaging cameras typically use the Johnson Criteria to determine its’ “detection” capability. The Johnson Criteria, used by thermal imaging manufacturers, indicates that 1.5 vertical line pairs ( 5 to 7 pixels) are needed to provide “detection”. Optical systems usually state that they need at least 10 pixels for detection. In the thermal imaging parlance, recognition is defined by whether an object can be discerned. For instance, is the target a tank, building, person, etc. Thermal Imaging cameras indicate that somewhere between 4 to 5 line pairs (about 10 to 15 pixels) are needed to make this determination. In the optical camera world, especially at the longest range of optics, we need more pixels for recognition. The specifications for the optical systems use a much more conservative >30 pixels for recognition. There is some confusion about this category. Most Thermal Imaging companies do not even discuss these criteria, as it is difficult to hit this performance level at distance ranges. In thermal imaging parlance, this is defined as a specific object being discerned, such as the object is friend or foe, or that the object is a T-72 tank or M1-Abrams. The thermal Imaging guide indicates that only about 6.4 line pairs (14 to 18 pixels) are required. In the optical world, “identification” means that you can identify a person’s face or license plate number. We define this as at least 50 – 80 pixels across the target object for the IP camera system. To learn more about what you can see with a thermal or optical camera, take a look at our article, Detection, Recognition, Identification – Thermal vs. Optical Camera. We also suggested an alternative to the Johnson Criteria that provides more predictable results. Take a look at the article, Detection, Recognition, Identification: The New Criteria. If you need more help defining your system, please contact us at 1-800-431-1658 in the USA, or at 914-944-3425 everywhere else, or use our contact form.